“Thank You” as the last prayer of the day and first prayer of the morning comes easily for Sister Marilyn Gooley. This special anniversary makes for a long gratitude list stretching over 50 graced years blessed with amazing friendships, supportive family and community, ministry opportunities, education, travel and enrichment. Blessings of good friends, good books, poetry, music, and the beauty of God’s world continue to give joy and energy. Jesus’ “mission statement” in Luke 4, with the passage from Isaiah fulfilled abundantly in Jesus’ life and ministry, continues to fire Marilyn, giving meaning and energy as she lives the SNJM charism through many volunteer ministries. 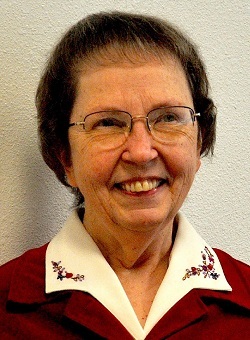 Providing meaningful integration of life and faith frames the passion Marilyn brings to adult faith formation ministry as she volunteers at the two Jesuit Tacoma parishes. Her home parish of St. Leo’s resonates with her deepest values, while intercommunity living for 20 plus years gives rich graces and blessings from life shared across diverse cultures, traditions, and backgrounds. While physical challenges bring limitations along with life’s inevitable losses, nothing eclipses that daily simple prayer. “Thank You” seems too small to hold all the gratitude for the day’s blessings, the incredible blessings woven through these 50 years.